Carista lets you customize things the dealer never wanted you to! So a few weeks ago we were sent this nifty little car plug. It’s a bluetooth enabled ODB2 connector, i know what you’re thinking...there’s nothing amazing about them and there’s like a million of them on the market. But this one’s different. It works with the Carista smartphone app for iOS and Android. It gets into the heart of your car, to the ECU, and finds little customizations you can switch on. You won’t find these options in your car’s menu system, they’re hidden away and normally need a laptop coupled with specialist dealer software to enable. Want to disable the annoying stop/start system permanently, sure thing. Increase the LED intensity for the side running lights, done. Make your mirror dip when you shift into reverse, that’s always handy. Disable the annoying beep when you’re going backwards, sorted. It can even turn off the seatbelt warning...probably illegal in your state or part of the world...but it can be done nonetheless. 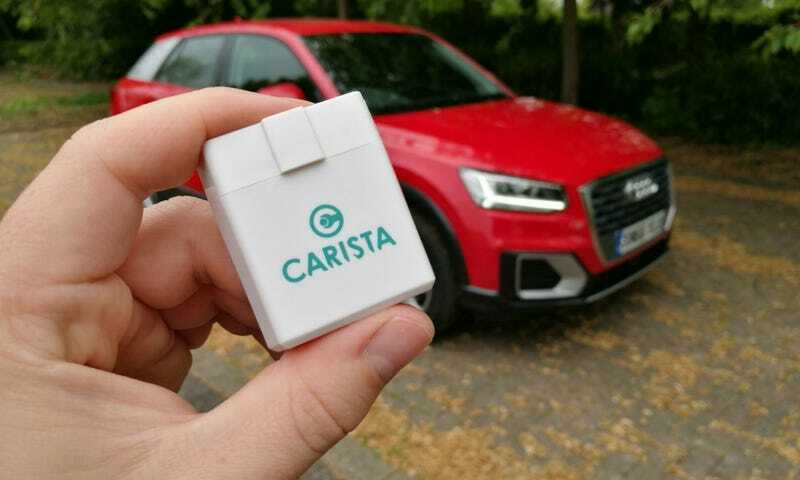 We tested Carista out on a brand new Audi Q2, whilst that car isn’t currently fully support by Carista we were still able to enable and play with a decent range of options. Currently, Carista mainly works with Audi, BMW, Lexus, Mini, Scion, Toyota and VW models. But you can basic fault read with any vehicle. It’s best to check if your car is supported here on Carista’s site, before purchase. Once in the app you’re presented with three options – Diagnose, Customize and Service. Diagnose will read any faults that the car is currently showing. Our brand new Q2 had three…the first two seem common in VAG cars and can be ignored as false positives. 01275 could well have been an issue, either something unplugged or a relay fault. Clicking on each fault will perform a Google search in your default browser. Sadly, pressing the back button wont return you to the app. You have to go back and reopen it. ‘Service’ will let you reset the service indicator warning that pops up on your dash. Handy for when you’ve had the car serviced but the mechanics have forgot to reset the counter. Once the app has scanned your car, hooked up with the Carista servers and worked out what it’s plugged into you’ll get the next screen. Here you can start to dig a bit deeper into the customization’s for your car. You can enable or disable various things, from the compass display in the drivers MFD, make the needles sweep at startup, show you speed in the dash display, make the car beep when locking/unlocking, auto fold the mirrors, disable the seat belt warning (highly illegal), disable the start stop, and lower the passenger side mirror when you reverse. The handiest feature we enabled, was in fact the tilting passenger mirror when reversing. It made it a lot easier to gauge the lines when parking in the higher than normal Q2. It was switched on through Carista in seconds, once the change was live you just have to set the mirror controls to the passenger side for it to work. No switching the car off or ‘rebooting’ needed. As with all the customization bits, none of them are to be found in the Audi menu system. Well the hardware is $39.99 from Amazon. A lil pricey for a bluetooth ODB device, but it will work with pretty much every phone app that is ELM327 compatible. You can fault read for free, but the fancy customization part costs. $9.99 will get you a weekly pass, whilst $39.99 pays for a whole year. You get a one month trial with the latter. If you try out the changes and want to reverse them within a week then all’s good. But it could get costly trying out different things one week at a time. Either way $80 for the hardware and a year’s worth of car modding...if you compare that to what a main dealer (even if they’re willing to enable certain options) would charge you, or even an independent tuning company…it’s going to be a damn sight more expensive than $80. Eventually they hope to support every car, in every market. But it take’s a long time to find and test all these hidden options. No doubt Carista will get there, but it’s a big challenge.